The industry standard plan take-off tool for entering linear measurements from your blueprints, maps, or plans into any Windows program. Just roll the scaler wheel along your print, then click to instantly transfer the measurement into your program. 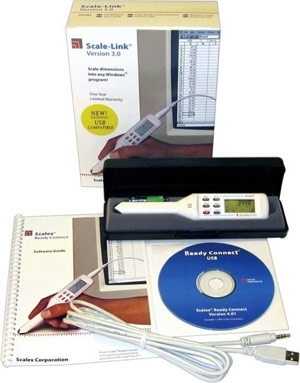 The "Deluxe Kit" Scale-Link USB3 is specially suited for all Microsoft Windows construction estimating software. Also works with Excel, Quatro Pro, Lotus 1-2-3 and other spreadsheets. And works with Access, dBase, Paradox, Foxpro and other databases. The Planwheel XLU 2 can be used without the interface kit if you desire to do so. If you buy the Deluxe Kit, you are saving money instead of buying the PlanWheel XLU 3 and Interface Kit separately. Scale-Link works with all versions of Windows.